Da Muddermark has us traveling to an apple orchard today in Rockingham County today to help save Annie Mae Appleseed (a direct descendant of Johnny). Annie is a professional apple picker and it seems she's bein' picked on by some of the other [bad] apple pickers who resent her new ways and the beaucoup bucks she's makin' over them! You can get the full story here. Bertie is on her way with apple martinis to help out the Apple Dumplin' gang to save Annie Mae (who, by the way, has promised Bertie and her tea party pals a bit of cashola for stampin' supplies! Woot!). Some of ya might want to wear protective head gear in case the shennanigans resort to bad apple flingin'. My friend, Moxie, is gonna be there, too, and she use to be a professional baseball pitcher, so beware! Hey! Ya wanna know how you make a bad apple turnover? Push it down hill!!!! Bwa-haaa-haaa-haaa! I used my Kittie Kits Cause a Scene (Master #1) from Rubbernecker to create my scene today based upon the inspiration teapot Cindy gave us. I used my double circle punch for the apples and the Stampin' Up cloud template for my sky. 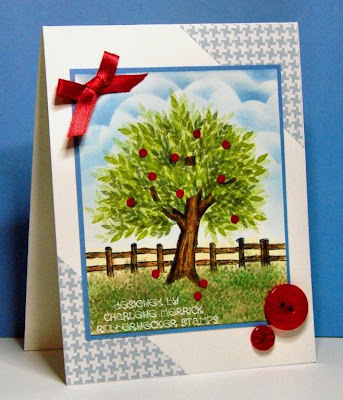 Most of the image is stamped with Stampin' Up inks except for the tree trunk and fence, which were colored with Copic markers. what an absolutely gorgeous scene! i sure hope there are no shennanigans going on. and bad turnover????? come on - LOL. LOVE your scene Bert!! Holy, moly cow is that tree ever gorgeous!! Loved reading your story too!! LOVE this scene Charlene!!! AWESOME in every way! That joke totally made me LOL too!! Blue martinis, apple martinis - anyone would think there was some theme going on here! DH loved this - he liked mine but when he saw the teapot,he didn't think it related to the challenge, whereas yours did. Hmmphh. I should have pointed out that you have no ladder - or that you've turned it into the fence!! LOL Charlene! This is too sweet! Love the bold colors, and that splash of red with the ribbon and buttons is perfect! Great cloudy bg too! Charlene.......have you seen Gertie? She's gone missing since. I have seen her since we we found her in Annie Mae's mother-in-laws stamp room! I was gonna call the sheriff to see if she's been arrested for lifting stamping supplies, but I am sorta enjoying the peace and quiet! I came here to see if Bertie was around, I suspect those two are together somewhere! You card was so precious.....did you see Kittie at the teaparty? Hope Bertie didn't nail her with an apple on her first visit! Okay, I agree...I shoulda proof read that! Charlene, this is adorable! See, now you and Kittie can BOTH tour the country and give sponging classes! I just love your tree--and the fence--and the apples--WELL, ALL OF IT!